Update March 08 - The new Seagull - See new Seagull section. Bit of a bargain this - a 1972 Silver Centuary Longshaft - no clutch. Starting fine and pumping a healthy amount of water. Has aproblem with the lower tube mount, where the lugs have been ground off ( doubless one went kaput somehow ) and a jubilee clip fitted. Needs looking at - either to consider a swapped out part, or to fit a more substantial clip. I'm looking into it - but for the moment, the thing is responding well to my inquisitive 'undoings'. I like to 'undo' most everything that ever might need to be 'undone' - that way it so much easier the 2nd time around, and in less ideal conditions. 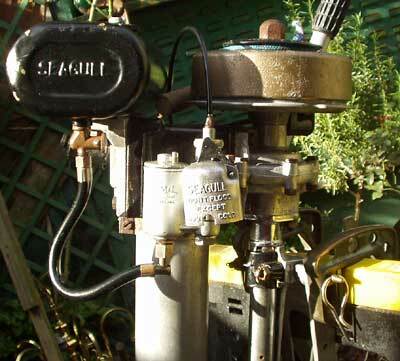 Amal carb has come off sweet and clean - no problems there at all. Being a 1972 - it can take the larger Amal jet for conversion to 25:1 - just need a small square ended box spanner to get to the old one. Apparently its the same size as a rad drainer plug - maybe with the sides thinned off a bit. 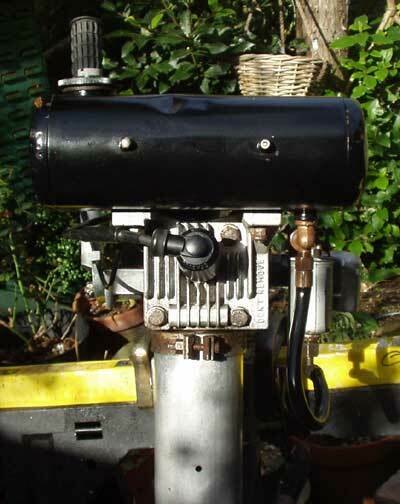 Tank is off - fuel tap all ok. Lower white nylon bracket eased up in its fixing holes quite easily. Generally - apart from the lug problem - its in very tidy nick and few ancillaries seem seized up. £ 40 - can't be bad. Lets hope I don't get the Seagull bug - too badly. This should have two lugs on with a clamp bolt - someone's had a go at it in order to get a fixing around. It had a jubilee clip on it - but it looks as if its been ground to take a U-bolt. That might be an option - with a suitable shaped metal clamping piece. I've a sneeking feeling a standard stainless u-bolt will fit those ground away notches ! We have an extended cruise planned for the last twp weeks of June - not sure where yet. Engine is sort of up together - just have to do the main engine filter and bleed it through and change the oil. Fitted a custom made adjuster bolt to the alt bracket - as I'd had some problems with it gradually loosening, end of last season. 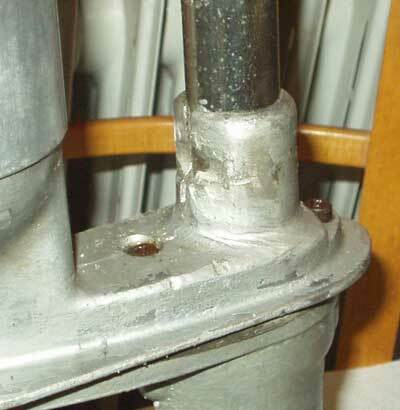 Need to drop the mast - so am going to try my alloy scaffold pole idea. Basically four 8'9" lengths of standard scaff pole, but in alloy ( about £ 30 for a twenty foot length - Deborah Scaff, Bristol ) joined with a standard joiner and with a swivel at the top to form an A frame. This will sit in front of the mast, rigged tight - then a block at the top lowers the mast from a loop passed up to the spreaders. Have sewn the rings into the mainsail for my patent 'downhaul cord' - with a view to dropping the main, when singlehanded, from the cockpit. All I need to do really, at minimum, is to fix a spinlock single clutch to the coachroof - 'ideally' it could have a winch there too, or a double or triple clutch to take the topping and vang. But I manage quite well with my topping lift system at the boom end - and the vang is controlled from the cockpit anyway - if a bit 'heath robinson'. But it works ! - Would be nice to have winch for the mainsail halyard - but that can always be added later - as can an extra clutch pair. I'm just being practical as to what will actually get done - I can prepare the coachroof for a winch and extra clutch - since I'm there squirting in thickened resin to bolt right through. Its all time though - as internally the fixings have to be flushed off pretty well and protected from headbutts, etc. White antifoul this season - same type, Seago Hard. Seemed to work ok, so I can do right from the white waterline with it - see if that stops the green slime around the boot top.